It sat still for almost half an hour, and then suddenly swooped down, caught something in its beak, and sped off towards a tree....I was left with mixed emotions - I had been feeling rather sorry for the poor bird having to sit in the rain and cold, but now I was left wondering if that was what the bird had intended - to wait patiently till its prey came along... 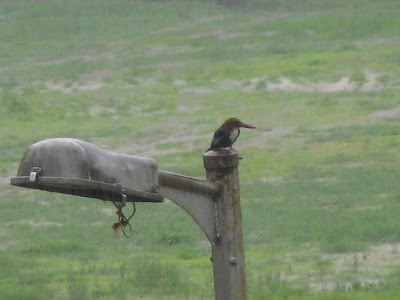 Does it enjoy the rain or is it just a matter of necessity? I have no idea, and am not likely to find out either... What do you think? Oh how lovely.. to watch the rains.. They have started showing up on this side too after the rains. 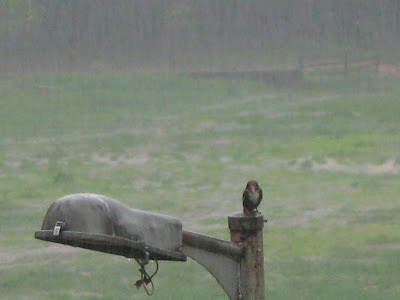 I am sure that all birds are programmed to handle the rain comfortably. Strange are the ways of a nature! I wish to get drenched in some rains too..and I promise not to prey on anyone..hehe!